Alamagan is a stratovolcano about 30-km south of the island of Pagan. Two historic eruptions are suspected in 1864 and 1887. It is located 146 nautical miles north from Saipan and is 4.4 square miles in area. 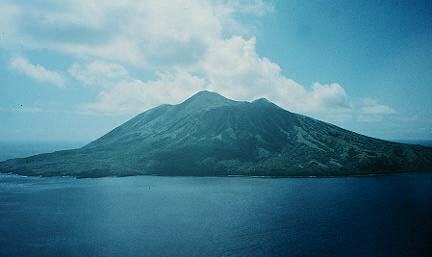 The island's volcano has a large crater at the summit. The west side is cut by deep gorges covered with high savanna grass. The southeast side is a steep slope of bare lava. There are deep valleys with caves. Coconut palms grow on the gradual slopes. Warm fresh water springs are located on the northern part of the west coast. Human impact: small resident population. Ecosystems: rain forest on lava flows, grasslands on ash slopes, tree ferns on upper slopes. Special features: dormant volcano; upper slopes of conservation interest. Cyathea alamagensis (tree fern) group? Endemic. Styphelia mariannensis only Micronesian locality. Megapodius laperouse laperouse (Marianas Megapode) group epidemic Subspecies, probably present, Rare (RDB). Practicality of conservation action 1.